Over at the Super Soaraway Currant Bun, what passes for “content” has been secreted away behind a paywall, but a Zelo Street regular has made some of it available via screenshots (see how that works, Rupe?). And from this it can be seen that some of the dinosaurs of Sun editions past can always be wheeled out to show just how sincere that apology for the Hillsborough stadium disaster smears really wasn’t. 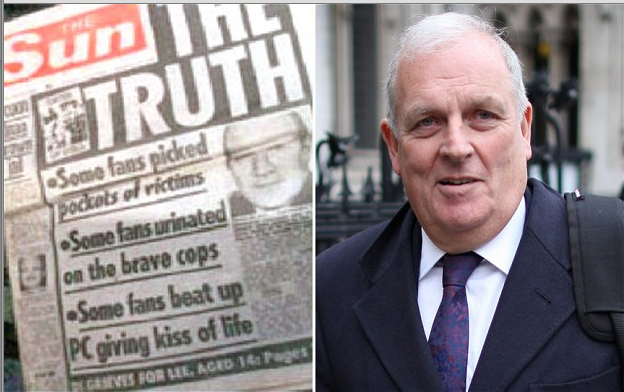 Yes, former editor Kelvin MacKenzie is back, and he is back whinging about those who do not present the news in a manner which meets with the approval of Himself Personally Now. The latest transgression from his unwritten rule comes from Channel 4 News: “THE Left-wing tossers who run Channel 4 News came out of their shadows to show their true colours the other night when reporting the not guilty verdicts on the four senior Sun journalists accused of paying public officials” he tells. What this means is that Kel is still sore about Alex Thomson doorstepping him. Anyhow, had they not reported the acquittal of the four? Well, they did report it: Kel’s beef is that the team putting the programme together prioritised other stories ahead of the one he wanted them to run. In other words, they exercised their editorial judgment. Rather like he failed to do at the Sun in the wake of the Hillsborough tragedy. It’s entirely possible that those outside the media bubble had very little interest in the trial. But Kel wasn’t allowing that sort of thought to enter: “The C4 News report lasted just 30 seconds … Had there been four convictions it would probably have taken up the whole hour … Clearly their dislike of the Sun influenced their editorial decision making”. So what is Kel going to do about it? “Perhaps somebody would like to get their regulator Ofcom involved”. Why don’t you make the complaint, Kel? Or are you just whining for the sheer hell of it? And, while you’re at it, why not come out and say unequivocally that you want to censor any broadcaster who doesn’t serve up right-wing garbage? Because that is what he wants to see, as witness the final paragraph of his rant: “This latest Channel 4 News editorial judgment reinforces my view that a Fox News-style network is needed in this country, if for no other reason than to balance the left-wing bias of television journalists both in London and Salford” (that last means the hated BBC). So, by the most fortunate of coincidences, a Murdoch loyalist proposes that what Murdoch is allowed to get away with in the USA should be replicated in the UK, on the basis of a bias that exists only in the apparently paranoid mindset of, er, Murdoch loyalists. And that’s before we have to mention that on Fox News Channel (fair and balanced my arse), their top rated host Bill O’Reilly has been caught lying about his past record. If a Channel 4 presenter did that, Kelvin McFilth would be screaming for their instant dismissal, especially if he was called Alex Thomson. The Sun man just doesn’t get it. Kel, you can have your own opinions. But you still can’t have your own facts. In the Guardian today Mackenzie tries to make out he grew up in a "working class" "upmarket council estate". He omits the bit about going to a private school. The guy just lies because that's what he does and what he has always done. Or as MacKenzie himself said "When I published those stories, they were not lies. They were great stories that later turned out to be untrue – and that is different. What am I supposed to feel ashamed about?" Quite. As an editor he published "stories" without adequate research to prove their accuracy (which given the nature of those "stories" was unforgiveable). I believe the "lob it in" approach is/was his term for it? About as useful as a reporter as a Louise Mensch wail in the wrong place!